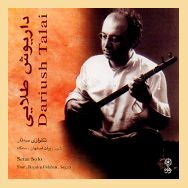 Dariush Tala'i was born in 1952. He began to study Tar at the age of ten with Master Ali-Akbar Shahnazi, descendent of the most famous musician family. Later He studied the ancient repertoire with other Masters such as Abdollah Davami. Very soon, he was recognized as being one of the most brilliant guardians of Iran's traditional music, while elaborating his personal style. Adding to his traditional apprenticeship, he followed musicology courses at university either in France or in Iran, becoming a respected professor at Sorbonne as well as at the University of Washington or The University of Tehran. The delicacy of his play makes him an irreplaceable accompanist, but also a high quality solist.